Remember when all the world was a playground? A special place for kids to imagine and create! Time to have fun and let the imagination take over and run free! MudFest is our summer place for your kids to have inspiring, imaginative, playful and creative hours through the summer months. Create a monster, a cup, a spaceship, a chia pet! Our very talented & popular kids teacher, Jacob, will guide your child through various clay building techniques and projects while focusing on their individual imagination and creativity. Your child will learn about clay, ceramics and art, all while fine tuning important motor skills, igniting their imagination and developing self confidence and social interactions that will last well beyond the walls of our studio. SPECIAL!! Register before June 17th and SAVE $20! Hurry! Class size is limited and will fill up fast! Sip & Create - a brand new take on that old Sip & Paint! Who says coloring books are for kids only? Grab your friends and head on down to the hottest new party time in town! 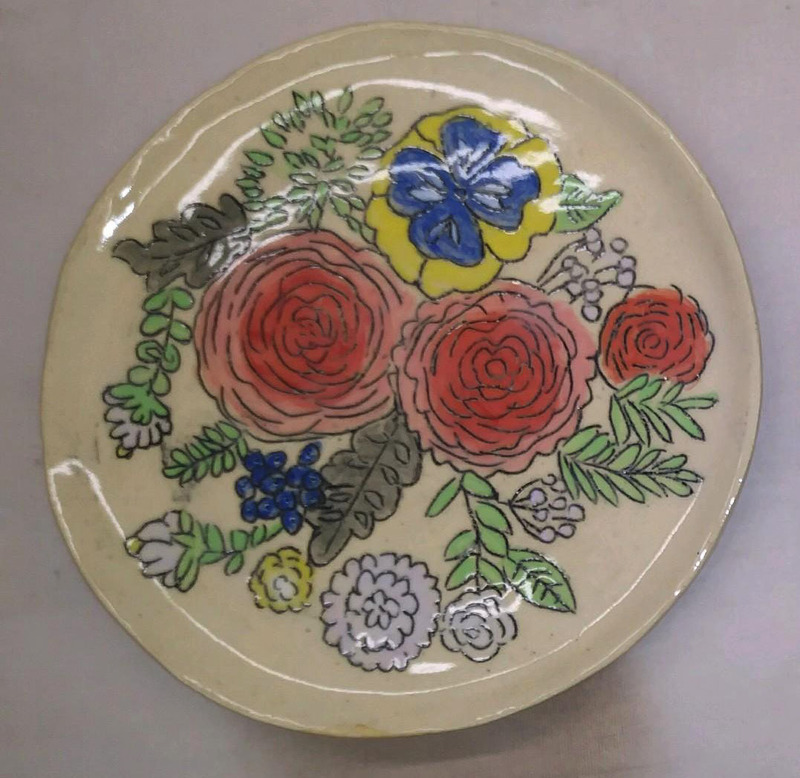 You'll start by creating a handmade clay dish with a coloring book type pattern. Next, you'll paint in your pattern while sipping wine and enjoying shared time with friends. Then you'll trace out the outlines of your pattern to put the finishing touches on your own little masterpiece. We'll finish and fire your creation in our kiln (oven) and you'll be able to pick up your one-of-kind handmade dish in about 2 weeks. Your finished piece will be microwave, oven and dishwasher safe so you'll be able to enjoy eating off of your dish or use it as a serving platter on your dinner table. $45 includes wine for sipping & all the materials needed to create your finished handmade dish. Create memories with your child by crafting functional and decorative ceramics. Not only does it build language skills, but manipulating clay helps children develop hand and eye co-ordination, develop the small muscles in their fingers and hands and hone their fine motor skills. All as they pound, pat, pinch and push the clay adding detail and form as they work to build their creative shapes and objects. Let's make a Sterling Silver Keepsake Charm out of Precious Metal Clay! Bring your best friends, your sweetheart or even just yourself to a one-of-a-kind evening you'll never forget. You'll be supplied with all the materials necessary to create your very own personalized embossed pendant, all while sipping wine and enjoying some pizza from the famous Dani's House of Pizza! And, of course, you'll take home with you your finished keepsake to cherish forever. Party size is limited to 8 people, so sign up now! Thinking about rekindling your past experience? Now is the perfect time to sign up and get your hands dirty! Pick any one of our three options. Join us for a 3-week introduction course , a full 7-week semester, or come and try a 1-hour one-on-one class. Register by June 10th for any 7 week class and save $20! Choose wheel throwing or hand building: day, evening or weekend classes. Sign up now to reserve your place in the class of your choice. We offer events for both adults and children in large or small groups. Whether it's a birthday celebration, a girls' night out, a casual get-together, or a holiday party, you can't match the fun you'll have getting down and dirty with us! So, gather up your best friends and family for a casual, fun and creative experience! Our professional pottery instructors will guide you on your mud-filled journey as you create great memories and ceramics! Reservations are required and food and beverage may be brought in or we can arrange for pizza and wine. At the end of the party, you'll have a work of pottery made by your hands to keep and treasure. 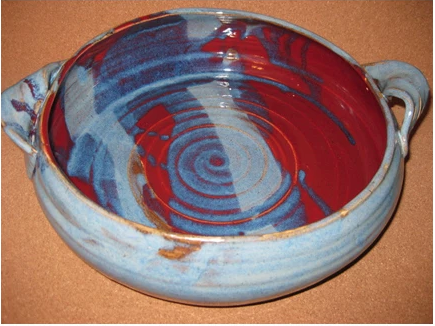 Your glazed and finished ceramic piece will be available for pickup within three weeks. We can accommodate up to 16 people. For more pricing and scheduling information, please call 718-441-6614. Our fellow potters Margaret Wozniak and Asta Bubliene are both exhibiting their work at some wonderful craft shows this spring. It's always a fun and interesting time for the whole family attending any of these wonderful events and what better way to spend a perfect spring day? Brookdale park is located at Watchung, Bellevue and Grove Avenues in Bloomfield/Montclair, New Jersey. 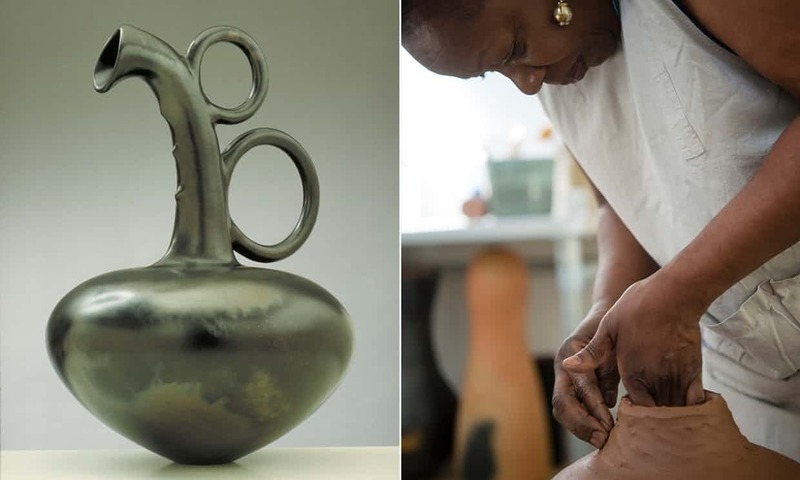 Record auction prices, pottery classes bursting at the seams, Instagram superstars and innovative young artists … what’s behind the boom in all things clay? Its elegant shape was inspired by ancient Aegean figures and its pleasingly mottled surface made it feel like it had just been dug up from the ground. Yet when it was first sold in the 1970s, this understated vase by the late British potter Hans Coper changed hands for just £250. 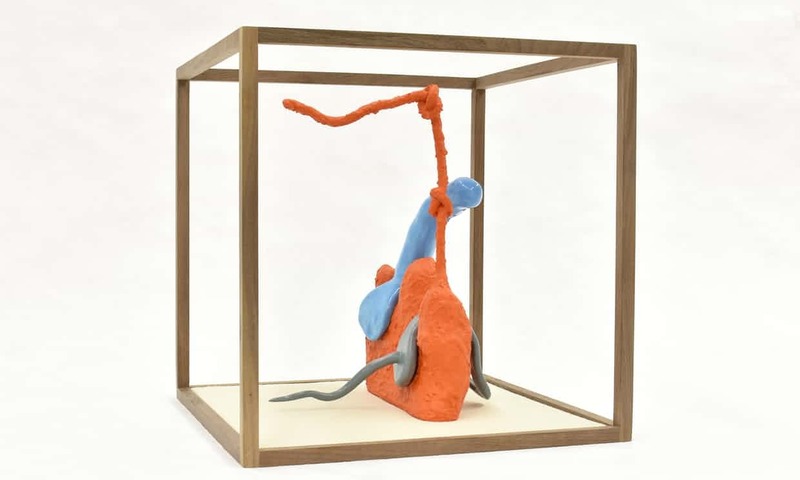 An unloved present, the creation was then kept in an old shoebox by its recipient, who finally decided to offload it last month – and was stunned to see its price soar to £381,000 at auction, a figure you might expect for certain Ming dynasty or Picasso vessels. The world of ceramics was stunned too, but not as much as it might once have been. 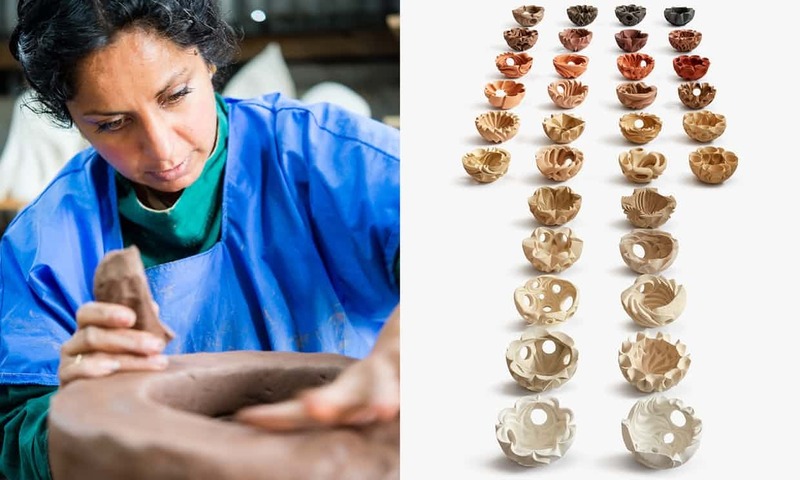 While it’s true that Coper is a key figure in British studio pottery, with works in London’s V&A and New York’s Metropolitan Museum of Art, what this whopping sum – more than double the previous record for a Coper – really reflects is the fact that ceramic art is currently experiencing something of a boom. Last month’s Ceramic Art London was oversubscribed like never before, with a queue of pottery nuts snaking around Central St Martins College, impatient to bag top contemporary pieces while they could still afford them (prices ranged from £30 to £10,000). The previous weekend, the Barbican’s conservatory was transformed into another ceramics fair, this time showcasing 60 artists from the Turning Earth collective’s two London studios. Many of these makers got their starts through taking classes there, while similar urban ceramic-making communities that pool resources and share kilns are flourishing across the country, including Glasgow Ceramics Studio and Clay Studio Manchester. In Cambridge, meanwhile, the Fitzwilliam Museum is celebrating a “spring of ceramics” with two simultaneous shows. The larger one, called Things of Beauty Growing, is a major survey of British studio pottery – a first for the museum, which is responding to what co-curator Helen Ritchie refers to as “a steady rise of interest” in the museum’s 20th and 21st-century ceramics stash. The show combines influential antiques from China, Korea and Japan with the work of 20th and 21st-century potters. These range from Bernard Leach(whose famous pottery lives on in St Ives), Coper and his teacher Lucie Rie(who both settled in Britain after fleeing the Nazis), through to Kenyan-born Magdalene Odundo (incoming chancellor of the University for the Creative Arts) and Edmund de Waal, best known for his installations of shelves of pale and delicate porcelain vessels, sometimes huddled in conspiratorial groups. 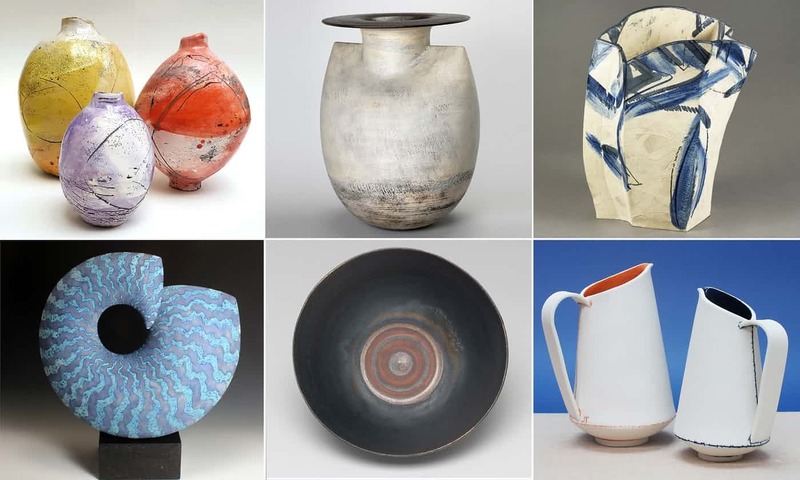 Recent exciting ceramics acquisitions for the museum, says Ritchie, include work from Alison Britton, famous for her colourful interpretations of traditional pottery vessels, and “a very hot artist” called Jesse Wine, who is based in New York but was born in Chester. “He makes this fabulous sculptural work,” says Ritchie, which ranges from vast organic earthy abstracts to glossily glazed renditions of his bowl of pasta, Sports Direct mugs with a snail idling between them and the Adidas sliders he wears to potter about in the studio. Some ceramic artists have become role models for an alternative way of life, such as Adam Buick, who has a few pieces in the Fitzwilliam show. “He makes only moon jars,” says Brundin, referring to traditional spherical vessels. “He lives on the Pembrokeshire coast, surfs every morning at six, digs his own clay out of the earth.” Sometimes he leaves a pleasing bowl impression in the ground, as is documented on his Instagram feed. “Instagram is a key driver for the younger generation of makers,” says Brundin. “It’s changing the way they sell.” The American potter Eric Landon, of Tortus studio in Copenhagen, is as close to a rock star as a potter could get, touring the world and posting to his 786,000 Instagram followers videos of himself with tanned, muscly arms effortlessly manipulating wobbly wet clay, or a selfie with Susan Sarandon at one of his workshops. Fashion and textiles illustrator-turned-potter John Booth says he gets a kick out of selling directly through Instagram rather than through galleries. New to the medium, he started an evening class at Turning Earth in 2015 and his first edition of 50 painted plates sold out in two days. Previously best known for designing prints for fashion house Fendi, he now funds his studio with his bright, crude vases. “It’s such a simple process and there’s a roughness to them – they’re for using,” he says of the works, built from slabs of clay, with faces painted on. Not surprisingly, such fashion figures as Simone Rocha and Silvia Fendi are fans of Booth’s pots. And, with ceramics’ roots in craft, they’re not the only designers who are ambassadors for the medium. Jonathan Anderson, the Irish creative director of Spanish luxury house Loewe, has admitted to making personal budget cuts to facilitate his Bernard Leach pottery collection, and this May will see the third instalment of his Loewe craft prize, which showcases ceramic artists among other makers. Meanwhile Raf Simons, the Belgian designer who is currently chief creative officer at Calvin Klein, has long been addicted to buying and selling ceramics and unflinchingly displays breakable Picasso pots in his living room.